With spring fast approaching so is wedding season! 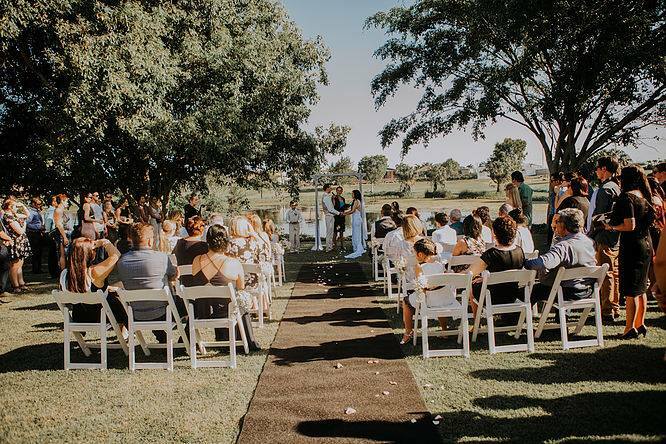 Our properties in Mackay, Bundaberg, Chinchilla and Lithgow offer ceremony, reception and catering options to make your special day a joyous occasion to remember. We have a range of packages available which can all be tailored to suit what you want and need. Our professional teams will help bring your vision to life so you can enjoy a day to remember with family and friends. As one of the largest event spaces in Mackay Windmill Motel offers ceremony, reception and catering packages for every budget. Our fully airconditioned function spaces can host all group sizes up to 200 guests and our professional functions team will ensure every detail of your big day is personalized and coordinated. Windmill’s wedding package includes onsite accommodation for the bridal party and discounted room rates for all guests. Our lush back garden, overlooking the goose ponds, is a beautiful location for your ceremony or your wedding photography. Sugar Country Motor Inn’s function room seats up to 60 guests and is the ideal central Bundaberg location for a small wedding reception. All functions are catered by our onsite contemporary restaurant – Canecutters Kitchen – which can provide casual, sophisticated and delicious food options for your day. With onsite accommodation for wedding guests and lots of parking nearby Sugar Country Motor Inn is an easy and attractive option for your reception. The Palms Motel is a convenient Chinchilla wedding venue with ceremony, reception and accommodation all available in a single booking. Our gazebo is a lovely spot for an outdoor wedding ceremony and our restaurant, which can seat up to 70 guests, opens on to our poolside patio which is perfect for post-ceremony/pre-dinner drinks. The Palms Restaurant caters for all functions and offers a range of dining solutions tailored to your group’s needs. Our on-site Surveyors Restaurant is a stunning space with high panelled ceilings, a rustic fireplace and french doors opening out to our grassed grounds. The restaurant space and fully equipped bar are available for exclusive-use function hire with a range of contemporary Australian catering options offered, all prepared by our esteemed local chef. On-site accommodation and parking are conveniently available for the wedding party and guests. The Bowen Inn’s Wedding Accommodation Package is offered to weddings located off-site in the surrounding Lithgow area. The package is inclusive of accommodation, a bus to and from the event and a pre-wedding cocktail hour for guests. We hope you consider hosting your wedding with Southern Cross Motel Group, please call us on 1300 979 746 if you’d like more information on any of our properties.